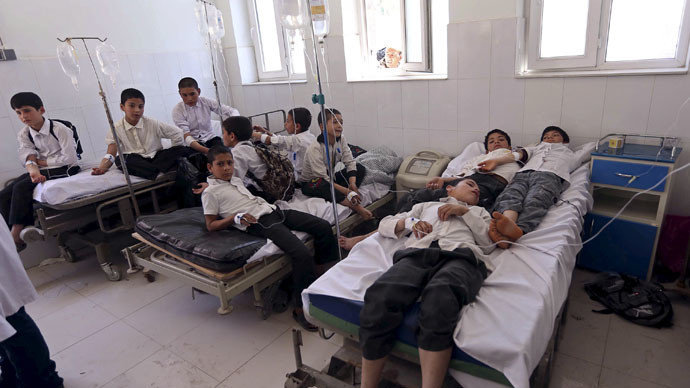 100 schoolboys have been hospitalized with suspected poisoning in the Western Afghan city of Herat. All of them appear to have eaten beans from a vendor, who advertised the meal as helping them to pass exams. The bean seller was arrested on Saturday, according to the police chief in Herat, Abdul Jabar Rozi, Reuters reports. Authorities in Afghanistan are investigating if the boys, aged 10-14, who have fallen ill, were deliberately poisoned. In the past the Taliban have poisoned both Afghan police and soldiers but occasional poisoning in schools has been found to be accidental food poisoning rather than a deliberate act. The poisoning comes a day after five aid workers from Save the Children were found dead 39 days after being abducted by the Taliban in the central province of Uruzgan. "The Taliban had demanded the release of five of their people in exchange but the central governor did not let them free. So they shot these people and we found their dead bodies from Chanarto district on Friday,” said Dost Mohammad Nayab, a spokesman for the provincial governor.